To honour mathematician and Spinoza Award winner Lex Schrijver, Centrum Wiskunde & Informatica (CWI) organized the CWI Lectures 2013 – the 'CWI Lexures' – on Thursday 25 April in Amsterdam. To honour mathematician and Spinoza Award winner Lex Schrijver, Centrum Wiskunde & Informatica (CWI) organized the CWI Lectures 2013 – the 'CWI Lexures' – on Thursday 25 April in Amsterdam. Schrijver is a world-renowned authority in the field of discrete mathematics and optimization. He is best known to the general public for his work on the optimization of the Dutch railway timetable and his popular lectures in Paradiso, Nemo and pop festival Lowlands. Schrijver, who is also a professor at the University of Amsterdam, will remain affiliated to CWI as a CWI Fellow after his retirement in May 2013. Colleagues praise Lex Schrijver for his pioneering and innovative research and for his modest and amiable personality. Keynote speaker Martin Groetschel, President of the Konrad-Zuse-Zentrum fuer Informationstechnik in Germany says: "In addition to his exceptional research results Lex Schrijver has produced outstanding monographs on combinatorics and optimization. They have shaped these fields and will stand the test of time." Keynote speaker László Lovász from the Eötvös Lórand University in Budapest adds: "Lex Schrijver is my very old friend. (...) He is also the mathematician I have most joint papers with, and we are always looking forward to opportunities to work together. (...) To start a new research topic with Lex, and share his knowledge and insight, has always been a fascinating time." 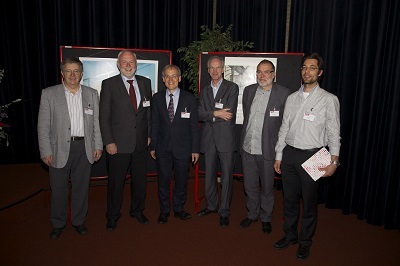 Picture: Keynote speakers CWI Lexures 2013 (from left to right), László Lovász, Martin Groetschel, Lex Schrijver, Leo Kroon, Willem Haemers and Dion Gijswijt. For his scientific work Lex Schrijver has received many awards and honours. Both in 1982 and 2003 he received the international Fulkerson Prize, and in 2003 the American Dantzig Prize. He won the Frederick W. Lanchester Prize twice, and the John von Neumann Theory Prize in 2006. In 2002 he received an honorary doctorate from the University of Waterloo in Canada. In 2005 the author was awarded the NWO Spinoza Prize, the highest scientific award in the Netherlands, for his "outstanding, pioneering and inspiring research in the field of combinatorics and algorithms". In the same year he was also named Knight in the Order of the Netherlands Lion. In 2008 Lex Schrijver and Adri Steenbeek, together with NS and researchers from Rotterdam and Padua, won the international Franz Edelman Award – also known as the ‘Oscar under the innovation awards’ – from INFORMS, for their work on European train schedules. Schrijver also won the SIGMA price for the educational maths project DisWis. Since 2009, Lex Schrijver is a Fellow of SIAM, the Society for Industrial and Applied Mathematics. In 2011 he received an honorary doctorate from the Loránd Eötvös University in Budapest. Recently Schrijver was appointed AMS Fellow by the American Mathematical Society (AMS), for "outstanding contributions to the creation, exposition, advancement, communication, and utilization of mathematics". Schrijver has been associated with CWI for a long time. From 1973 to 1979 he started working at CWI, which was at the time called Mathematisch Centrum. Then he became a professor in Tilburg. From 1989 he has worked for CWI and in 1990 he was also appointed part-time full professor at the University of Amsterdam. He became a member of the Royal Netherlands Academy of Arts and Sciences and of three academies abroad. Schrijver published more than 120 articles and wrote several books, which have now become standard works. Mathematics is very important to Lex Schrijver. In the popular scientific book ‘Opgelost!’ (Solved!) he said: “Mathematics is like oxygen. If it's there, you don’t notice it. If it weren't there, you notice that you cannot do without”. CWI Lectures georganiseerd ter ere van wiskundige Lex Schrijver Ter ere van wiskundige en Spinozaprijswinnaar Lex Schrijver organiseert het Centrum Wiskunde & Informatica (CWI) in Amsterdam op donderdag 25 april de CWI Lectures 2013: de 'CWI Lexures'. Schrijver is wereldwijd een autoriteit op het gebied van discrete wiskunde en optimalisatie. Bij het grote publiek verwierf hij niet alleen bekendheid door de optimalisatie van het Nederlandse spoorboekje maar ook door zijn optredens in Paradiso, Nemo en op popfestival Lowlands. De onderzoeker, die naast zijn aanstelling op het CWI als hoogleraar verbonden is aan de Universiteit van Amsterdam, zal na zijn pensionering in mei 2013 aan het CWI verbonden blijven als CWI Fellow. Collega’s roemen Lex Schrijver om zijn baanbrekende en innovatieve onderzoek en om zijn bescheiden en aimabele persoonlijkheid. Hoofdspreker Martin Groetschel, President van het Konrad-Zuse-Zentrum fuer Informationstechnik in Duitsland schrijft: "In addition to his exceptional research results Lex Schrijver has produced outstanding monographs on combinatorics and optimization. They have shaped these fields and will stand the test of time." Hoofdspreker László Lovász van de Eötvös Lórand University in Boedapest voegt daaraan toe: "Lex Schrijver is my very old friend. (...) He is also the mathematician I have most joint papers with, and we are always looking forward to opportunities to work together. (...) To start a new research topic with Lex, and share his knowledge and insight, has always been a fascinating time." Foto: Sprekers CWI Lexures 2013, v.l.n.r. László Lovász, Martin Groetschel, Lex Schrijver, Leo Kroon, Willem Haemers en Dion Gijswijt.